Among Springfield Ohio hotels, the Courtyard Springfield Downtown hotel balances an amazing sense of history with urban for the ideal business or pleasure travel experience. 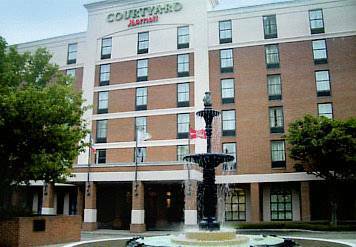 Located adjacent to the Heritage Center of Clark County and the Clark State Performing Arts Center (Kuss Auditorium), the Courtyard Springfield OH hotel offers beautiful displays of art, comforting fountains and a park-like setting. This hotel in Historic Springfield Ohio is near a variety of antique shops; visit the Westcott House - a Frank Lloyd Wright home, Springfield Museum of Art and much more. The Courtyard Springfield hotel is near Wittenberg University, Clark State Community College, Cedarville University & Urbana University. Entertain your taste buds with breakfast or dinner at Mela Urban Bistro. Chef Garry and his culinary team will delight you with creative & outstanding dining selections. Your experience at the Courtyard by Marriott Springfield Downtown hotel will make you feel at home and you may never want to leave! - Dole Fresh Vegetables, Inc.